Carolyn is a big fan of Devon and Blakely, a lunch spot in Washington, DC that serves lots of different soups and salads. 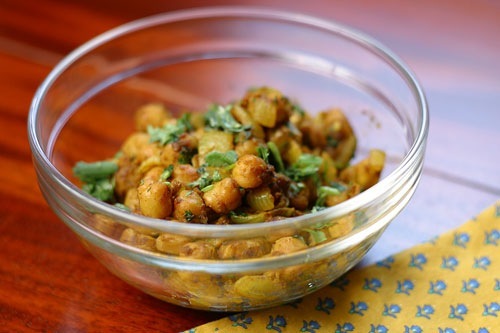 One of her favorite side salads is Channa – chickpeas baked with olive oil, curry, cilantro and caramelized onions. So, me being the good person I am, set out to try and recreate the salad. 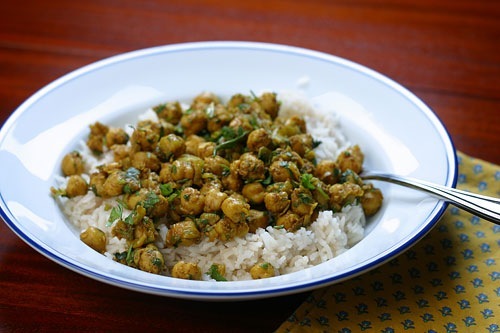 A quick googling search resulted in a recipe for curried chickpea salad. The salad turned out great, and she said it was pretty close to the Devon and Blakely recipe, but not exactly the same. The quest lives on, but I have found a great recipe in the process! This recipe calls 1 teaspoon of cayenne pepper, which is a lot. Seriously. However, it does not end up tasting too spicy. I happened to have whole cloves on hand. That is just because I tried making mulled cider once. Most normal people don’t have this though. Sub in some ground cloves instead, maybe 1/4 teaspoon or so. The cloves really add a lot to the flavor, so don’t forget them. Stir in garlic, ginger, cloves, cinnamon, cumin, coriander, salt, cayenne, and turmeric. Cook for 1 minute over medium heat, stirring constantly. Mix in garbanzo beans and the water. Continue to cook and stir until all ingredients are well blended and heated through. Remove from heat. Stir in cilantro just before serving, reserving 1 tablespoon for garnish. Note: The Devon and Blakely salad is served slightly warm, but both salad versions taste great warm or cold. Thank you for this! Can you also decode the components of D&B’s saffron-y (?) cauliflower and pine nut salad? I’ll add also that the Channa chickpea salad also has tomatoes and carmelized onions, which add some sweetness. We are always up for a challenge! They just opened a location near my job, so I am on the case. We have started adding some canned tomatoes, but we will have to try caramelizing the onions.